Tag Archive | "Delray Beach International Tennis Championships"
Juan Martin Del Potro returned to the winner circle today. Del Potro fought off Janko Tipsarevic in the final of the Delray Beach International Tennis Championships with a 6-4,6-4 victory to earn his first tour title since the 2009 U.S. Open. At the conclusion of his semifinal match last evening, Del Potro emphasized that despite being exhausted he would give it his all in the final. Early on, Del Potro looked conspicuously fatigued. Although the Argentine held easily his first service game, it was more a consequence of Tipsarevic making too many errors. After getting ahead 2-1, Tipsarevic lined up a backhand down the line winner beautifully to secure double break point. As a result of a Tipsarevic errant forehand and a questionable second serve ace, Del Potro got to deuce. After giving the umpire a piece of his mind, Tipsarevic connected on a forehand crosscourt winner for a third break point. That time when Del Potro misfired with the backhand down the line, Tipsarevic had the break for a 3-1 edge and later consolidated. 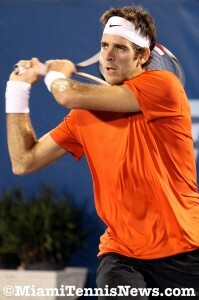 Despite difficulties, Del Potro guarded serve the subsequent game. Next, showing a burst of energy for the first time, Del Potro sprinted to track down a Tipsarevic dropshot and put it away for a winner. With that Del Potro had break point. He converted when Tipsarevic’s forehand up the line landed long. After quickly getting to 4 all, Del Potro provoked a forehand miscue from Tipsarevic on game point for deuce. With two additional mistakes by Tipsarevic, Del Potro obtained the break and a 5-4 advantage. Serving for the set, Del Potro had two shots go off course and double faulted to hand Tipsarevic triple break point. 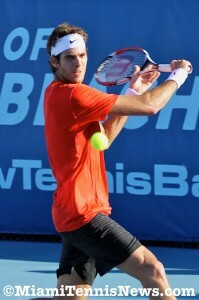 By hanging tough and serving well, Del Potro arrived at deuce. The Argentine wiped out two more break points and ultimately on his third chance secured the opening set. Despite outplaying Del Potro in the previous set, Tipsarevic found himself behind in the scoreboard. Nevertheless, the Serb attempted to soldier on. The initial game of the second set, thanks to his long wing span, Del Potro caught up with a backhand volley from Tipsarevic and struck a backhand pass for a winner for break point. With great defense, Tipsarevic denied Del Potro the game. Five game points later, Tipsarevic captured the first game. Following a couple of comfortable service games, at 2 all, Tipsarevic fumbled a backhand down the line to give Del Potro double break point. The Serb then double faulted to gift Del Potro a 3-2 lead. 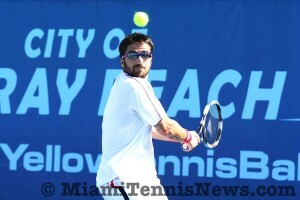 Later, with a forehand volley winner, Tipsarevic manufactured double break point of his own. Yet, on both occasions, he was turned away. Tipsarevic had two more opportunities to break in that game, but Del Potro shut him out. After salvaging his eleventh out of twelve break points, Del Potro consolidated for 4-2. Although Tipsarevic continued to press, Del Potro aided by a vocal Argentine public held on for a 5-3 lead. Serving for the match, Del Potro revved up the mph on the serve to get to triple championship point. When Tipsarevic’s forehand crosscourt sailed long, Del Potro captured the title. In analyzing the match, Tipsarevic iterated that it boiled down to “not executing well. . . .and not taking my chances”. For Tipsarevic, the first set was pivotal because “I was disappointed that I lost it even though Del Potro was not playing his game”. Del Potro was frank in saying “I think [Janko] deserved to win the first set. . . I was trying to focus on my serve [the first set] because I knew it was only one break. . . I knew I would have the opportunity to comeback. . . When I had it, I took it. I had a little bit of luck granted. . . My forehand began to work which helped me in closing out the first set”. Derailed by a wrist injury in 2010, Juan Martin Del Potro’s last final was the 2009 U.S. Open. Tonight, the Argentine took care of American Mardy Fish 6-1,7-5 in the semifinals of the Delray Beach International Tennis Championships to advance to his eleventh career final. Following a comfortable opening game, Del Potro obtained a break point when Fish pushed a forehand up the line wide. With a forehand crosscourt winner, Del Potro broke. This was the first time Fish had surrendered his serve the entire tournament. When Del Potro’s forehand crosscourt landed wide, Fish had a break point of his own. However, after scrambling beautifully to defend, Fish misfired on a neutral backhand down the line to let Del Potro off the hook. With two good serves, Del Potro consolidated for a 3-0 edge. Subsequent to both players holding without difficulty, Fish committed three straight errors to hand Del Potro triple break point. By bludgeoning a forehand crosscourt for a winner, Del Potro broke again for 5-1. Promptly with another unadventurous game, Del Potro pocketed the set. Throughout the initial set, Del Potro was crushing the ball and Fish played right into the Argentine’s hand by camping out on the baseline. The second set, Fish altered his strategy and decided to take his chances at net. Subsequent to a difficult hold, Fish provoked three forehand flubs from Del Potro for double break point. When Del Potro’s backhand failed to go over the net, Fish had a 2-0 lead. But, by connecting on a backhand down the line for a winner, Del Potro got to break point. 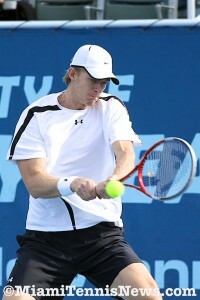 When Fish’s forehand bounced wide, the players were back on serve. Nevertheless, Fish continued to press and again with three miscues in a row from Del Potro, he arrived at triple break point. On that occasion, Del Potro double faulted to gift the American the break. Despite facing a break point, Fish ultimately consolidated for a 4-1 advantage. Although his service games got harder, Del Potro kept up with Fish to limit the deficit to one break. Serving at 4-2, Fish made three mistakes to donate double break point to his adversary. Del Potro gladly accepted by ripping a forehand down the line which lead to Fish’s response going wide. Then at love, Del Potro leveled the set at 4 all. With a quick hold, Fish inched ahead 5-4. Yet, Del Potro had no problem squaring the set. Later, off a booming backhand down the line by Del Potro, Fish watched his backhand land into the net to give the Argentine break point. Del Potro converted by overpowering a forehand which resulted in a mistake by Fish. After falling behind 0-30 while serving for the match, Del Potro produced two sensational winners to get to 30 all. When Fish’s forehand did not clear the net, Del Potro had match point. 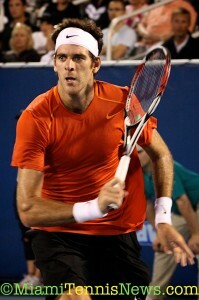 Del Potro sealed the victory when Fish misfired with the backhand. Earlier this year, Janko Tipsarevic and Kei Nishikori met in the quarterfinals of the Chennai Open with the former besting the latter 6-4,6-4. 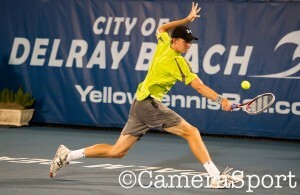 This afternoon, the two had a rematch in the semifinals of the Delray Beach International Tennis Championships. Once again, Tipsarevic got the better of Nishikori by the same score to move on to his third career final. As the 2008 champion, Nishikori has great memories from this venue and began strongly with a love hold. When Tipsarevic flubbed an overhead off a defensive lob, Nishikori was one point away from taking a 2-0 lead. However, with his opponent making three consecutive errors, Tipsarevic managed to guard serve. From that point on in the first set, Nishikori was the one pushing the envelope while Tipsarevic was satisfied with putting the ball in play. As a result of that tactic, Tipsarevic forced multiple miscues from his rival. Nishikori had to bounce back from love-30 to stay ahead 3-2. But serving at 4 all, Nishikori netted a backhand crosscourt to hand Tipsarevic double break point. When Nishikori sent another backhand long, Tipsarevic captured the break for a 5-4 edge. Then at 40-0, Tipsarevic thumped an ace to put the set to bed. During the interlude, Nishikori had an injury time out to address his foot. Showing no ill effect, Nishikori went back to work. Subsequent to an opening double fault, Nishikori fought hard and salvaged the game for 1-0. 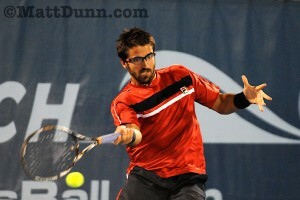 Now in a groove, at love, Tipsarevic found the equalizer. Next, by floating a forehand wide and committing a double fault, Nishikori was in a love-30 hole. After recovering and getting to game point, Nishikori produced another mistake leading to deuce. When Nishikori sliced a backhand wide, Tipsarevic had break point. Tipsarevic converted as a result of Nishikori loosing control of a forehand stroke. With another error plagued game from Nishikori, Tipsarevic easily consolidated for 3-1. Despite staying one break down, with a myriad of errors, Nishikori failed to rattle Tipsarevic’s serve. Consequently, as in the first set, an untroubled Tipsarevic arrived at triple match point and with an ace booked his spot into the final. In his post match interview, Tipsarevic stated: “I’m really happy with the week and my match today.” When asked what he thought was the key to his win, Tipsarevic commented: “the main difference was the serve. I managed to win one or two points per service game on my serve just by making an ace or a good serve while Kei had to grind for every possible point on his service game.” Moreover, Tipsarevic cited: “Novak [Djokovic] beating [Roger] Federer today made me want to win just a little bit more”. In fact, Tipsarevic received a congratulatory text message from his countryman, Djokovic, after his victory. To claim his first ATP title, Tipsarevic will have defeat either 2009 Delray Beach champion Mardy Fish or 2009 U.S. Open champ Juan Martin Del Potro. Fish and Del Potro will clash in the night session. 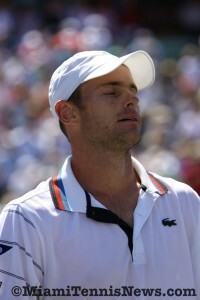 Citing flu-like symptoms, Andy Roddick has pulled out of the the 2011 Delray Beach International Championships. Roddick held a press conference this afternoon where he expressed his disappointment at having to pull out of the event given that he has not played the tournament since 2003. On his condition, Roddick stated that ” I woke up yesterday and felt like I got hit by a bus”. Tuesday’s night session will now feature Juan Martin Del Potro taking on Richard Berankis. Delray Beach, FL – Top seed Andy Roddick has pulled out of the Delray Beach International Championships because of illness. Roddick said during a press conference late Monday afternoon that he began experiencing flu-like symptoms prior to his Memphis final and has been prescribed antibiotics. Roddick won his 30th ATP World Tour title Sunday when he defeated Canadian Milos Raonic in three sets at the Regions Morgan Keegan Championships in Memphis, joining Roger Federer and Rafael Nadal as the only active tennis players to win at least 30 ATP titles. Roddick, ranked No. 8 in world, notched the victory with a remarkable diving forehand shot down the line on match point. Roddick’s spot atop the bracket has been filled by qualifier Marinko Matosevic. 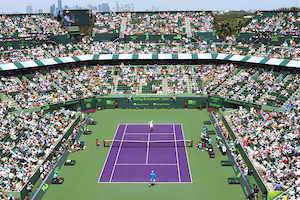 Tournament director Mark Baron announced that Tuesday’s evening session would begin at 5:30 pm with a Ashley Fisher/Stephen Huss vs. Jack Sock/Donald Young doubles match, followed by a 7:15 pm Juan Martin del Potro vs Richard Berankis ATP World Tour first round match, followed by the ATP Champions Tour Final.